I guess everyone likes tulip flowers and, I hope that you love them too. For me, tulips flowers always mean spring time. Especially the month of May when everything is so fresh. The skies are fresh, the air is new, new hopes, new plans…you just name it. Each time I transit Amsterdam Airport I can’t help to stop at the airport tulip souvenir shop. They sell bulbs of various tulip species. 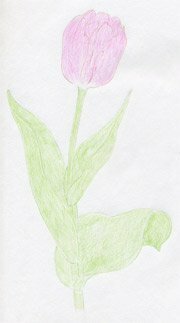 Many of us associate tulips with Netherlands. But, did you know that the name of tulip and the flower itself originates in Persian Empire? I picked this simple tulip flower as a drawing exercise. You are going to love it! 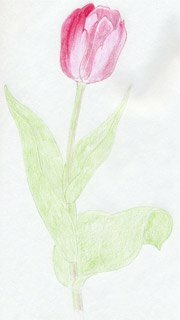 Do You Love To Draw Tulip Flowers? Basically, if you can capture these 3, you can draw proportionally well-balanced flower. Draw the stem by one single and weak pencil line. Remember how the stem is curved? Approximately on the top of that make a sketch of the flower head. Outline the contours of leaves. 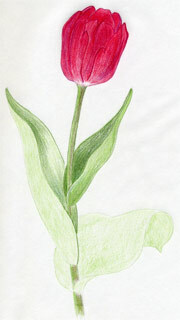 Tulips usually have straight leaves but they tend to fold on the lower part of the stem. Begin to work out the leaves so that they will start to look like real leaves. Make special attention to the lowest leaf. Yes, that which is folded outwards. Why? 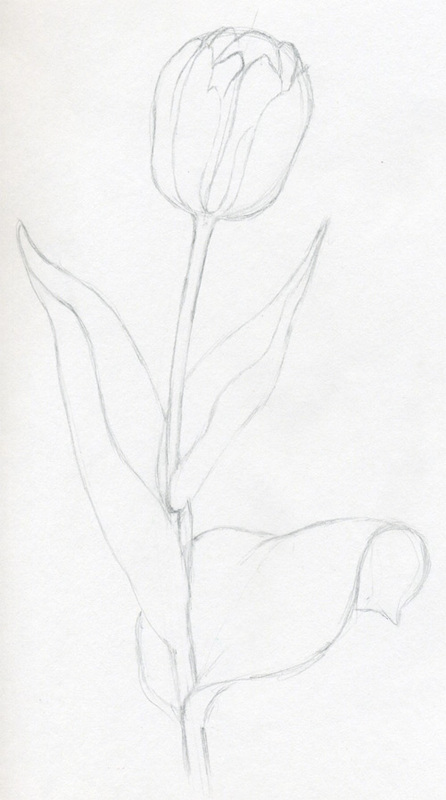 Because that leaf gives this tulip more realistic look. Can you notice that? Decide the thickness of the flower stem proportionally to the whole size of the flower. Not too thick and not too slim. Also notice where the leaves cover the stem and, where the leaves cover each other. This is important! Tulips are very easy to draw but three-dimensional pictures have certain rules we must obey. 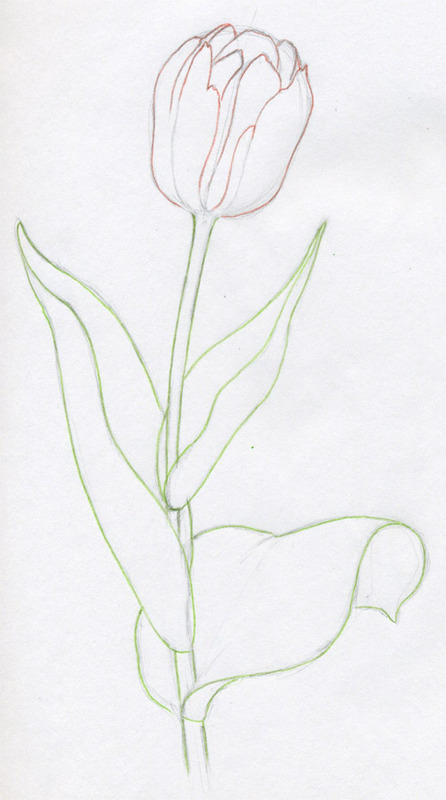 Outline the contours of tulip petals and you can erase unnecessary pencil lines. 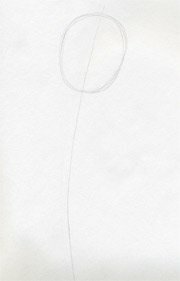 Draw the contours of the flower by color pencils over the initial graphite pencil lines. Be careful! Flower head is pink and the rest is green. 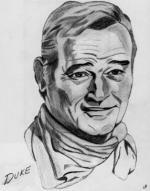 Erase all residual graphite pencil lines and your drawing should look like this or better. 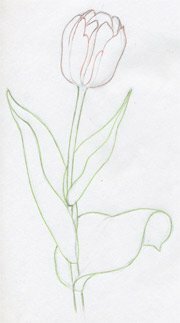 Now you have a beautiful template for tulip flowers coloring page. Use the same two color pencils and fill up the green parts and the tulip head. No shading yet - just plain, weak, as if a smoky color. Add darker red and pink color tone on the petals. Lower part of the head is slightly brighter (lighter) – almost white. 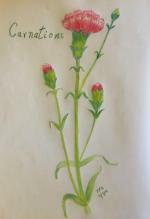 Add more dark green to the flower stem and in similar fashion begin to darken the leaves. Since the upper two leaves are folded along the length, the inner parts become naturally darker – as if in a shade. You can experiment with green leaves, shading them a bit. Unleash your fantasy. 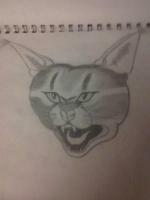 Make your drawing better than mine! Let’s polish your tulip flowers drawing skills further. Just observe and draw from the pictures without reading my comments. 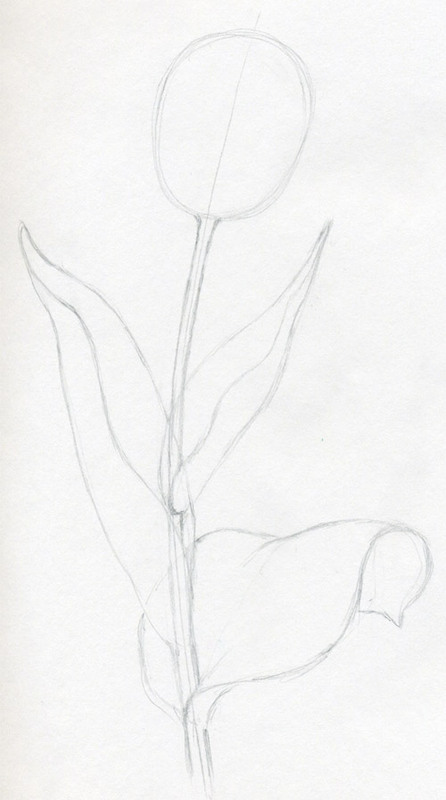 Outline the stem, the tulip’s head and the leaves. Do it as quickly as you can using tilted pencil grip. 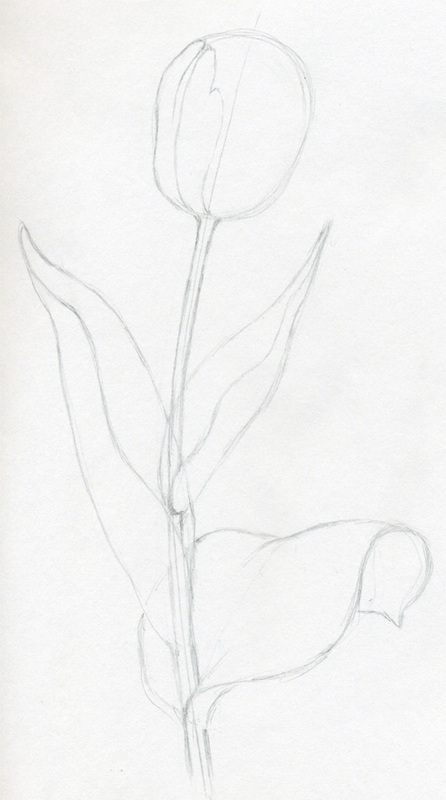 Mark out the contours of the tulip’s petals. Shapes of tulip petals usually determine the image of the whole flower. 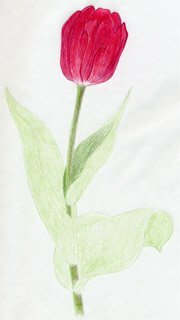 Keep this in mind while you are drawing tulip flowers. 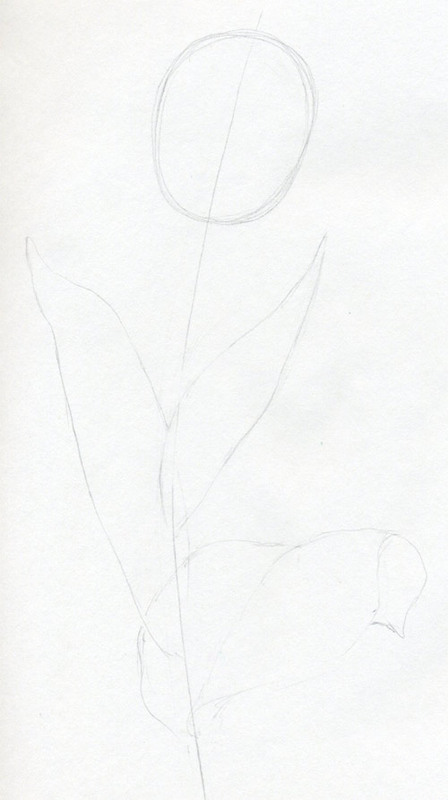 Decide the thickness of the flower stem and draw the contours of all three leaves. Notice how the leaves fold and where, how they cover the stem and each other. 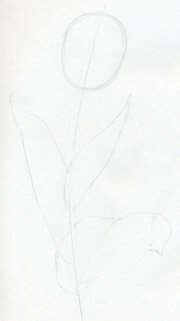 Outline the contours of the flower as you see on the picture. Carefully because colored pencils are not so easy to erase as graphite pencil. Erase the residual graphite pencil lines so that only green and pink colored pencil lines remain. Now, just flat color both, green part and the pink part. No shading yet. 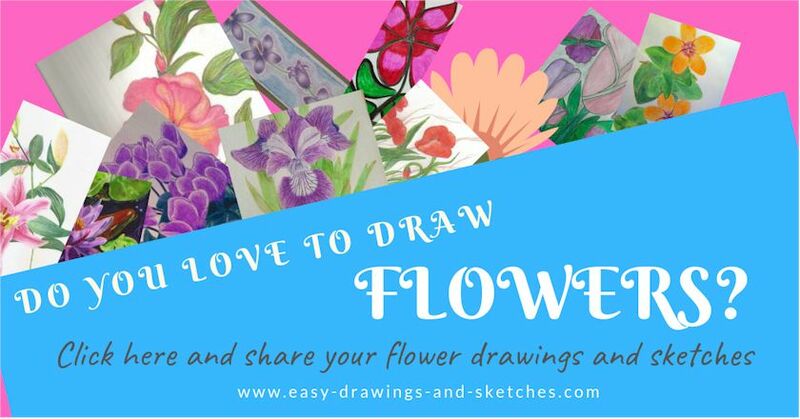 I always begin to draw the details from the flower’s head and, I also recommend you to do the same. You can keep control over your tulip drawing. 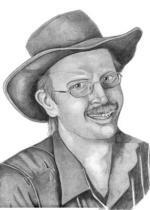 In other words, once you have the tulip’s head ready, you are more than seventy percent done. 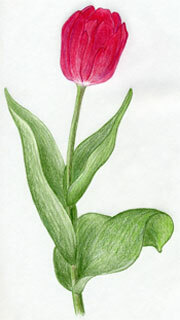 Shading the leaves of tulip flowers is the easiest part and doesn’t require special care as it is in other flowers. When the tulip’s head is finished begin to shade the leaves. 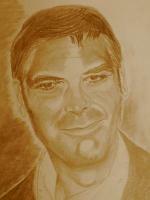 You’ll need one or two different darker green color tone pencils to do it. Notice, that the inner area where the leaf curls its edges around the stem is naturally darker, so make it look darker. You’ve finished both drawing exercises; you are now well equipped to be able to draw any kind of tulip flowers of your choice.